A small investment in hearing aids may reduce some of symptoms of dementia. Dementia is typically associated with declines in cognitive function. Yet researchers have found an association between dementia and declines in hearing and other basic sensory functions. Their studies suggest that people with hearing loss are more likely to develop dementia, and that age-related hearing loss may also increase the severity of dementia symptoms. Some studies even found that hearing loss was specifically associated with an increased risk of developing mild cognitive impairment, which can be considered an early stage of Alzheimer's disease. Together, these studies suggest that hearing loss could be a potential risk factor for dementia and an early sign of Alzheimer's disease. Unanswered questions include whether hearing loss and dementia are both the result of a general age-related decline in brain function, or if hearing loss somehow directly or indirectly contributes to dementia symptoms. More recently, human clinical trials have provided some evidence that hearing loss may have a causal role in dementia. 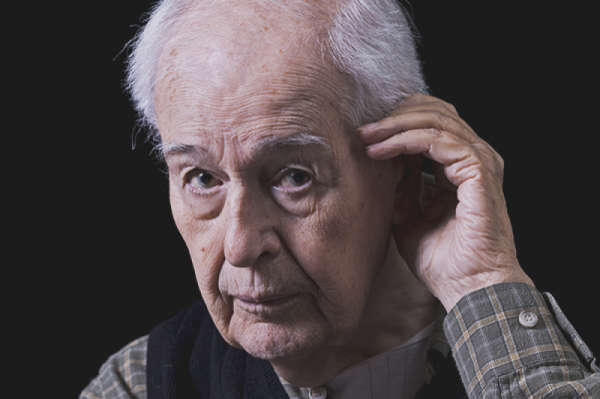 One study found that elderly participants with profound hearing loss who did not have dementia showed cognitive improvement and fewer depressive symptoms after receiving a cochlear implant. A recent pilot study reported that an intervention that included the use of a hearing-amplification device and communication-skills training improved the symptoms of dementia patients who scored high on depressive and psychiatric tests at the beginning of the study. These studies suggest that improving hearing may alleviate dementia symptoms, although indirectly. It should be noted that other studies did not see an improvement in measures of dementia when patients were given hearing aids. More research is needed to identify which, if any, dementia patients may benefit from correcting hearing loss. Although studies indicate that human hearing loss may indirectly contribute to dementia, a recent study with mice suggests that hearing loss could have a more direct contribution as well. Experimenters exposed mice to a brief loud noise early in life to induce hearing loss. The mice with hearing damage, relative to a control group of rats with intact hearing, showed impaired performance on a memory task when they were tested three months later. The hearing-impaired rats with memory problems also generated fewer new cells in the hippocampus, a brain region that's key for normal memory function and impaired in many diseases involving dementia. It should be noted, though, that there could be alternative explanations to the long-lasting cognitive impairment. For example, the impaired memory and brain function could have been caused by stress related to the initial loud-noise exposure. Nevertheless, this study points to the interesting possibility that the processes involved in age-related hearing loss relate to decreased function of the hippocampus. 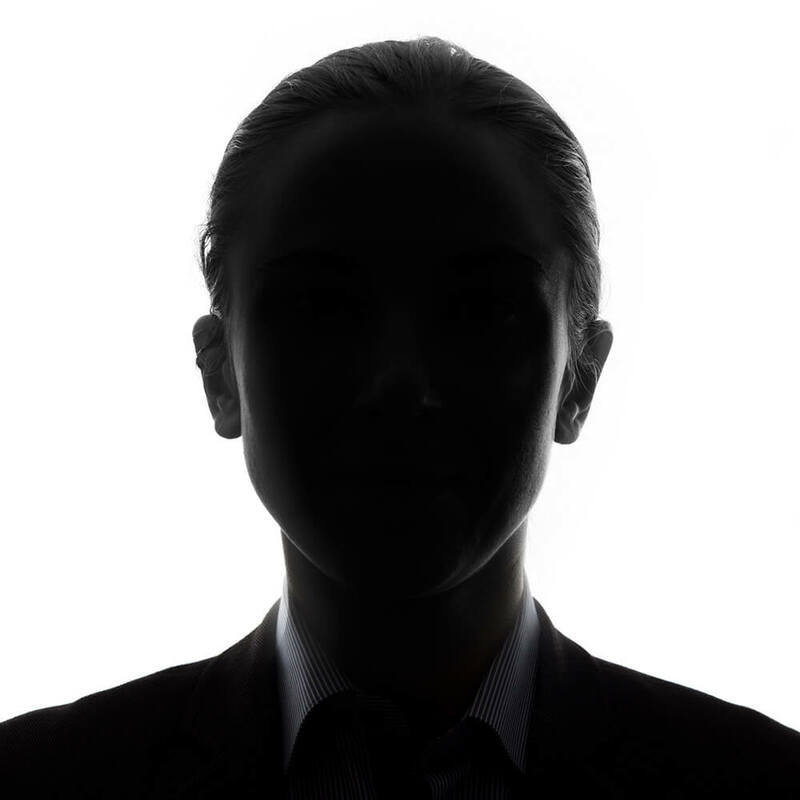 This in turn could increase risk for developing dementia and its severity. Although it is unlikely that correcting hearing impairments will cure dementia, it may help reduce symptoms and improve overall quality of life. 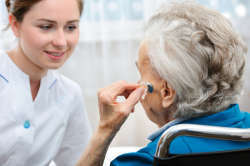 Given the low risk related to hearing devices and their relatively low cost, caregivers of dementia patients have little to lose by investing in measures to improve the hearing and communication of dementia patients. Amieva, H., Ouvrard, C., Giulioli, C., Meillon, C., Rullier, L., & Dartigues, J. F. (2015). Self‐reported hearing loss, hearing aids, and cognitive decline in elderly adults: A 25‐year study. Journal of the American Geriatrics Society, 63(10), 2099-2104. Dawes, P., Cruickshanks, K. J., Fischer, M. E., Klein, B. E., Klein, R., & Nondahl, D. M. (2015). Hearing-aid use and long-term health outcomes: Hearing handicap, mental health, social engagement, cognitive function, physical health, and mortality. International Journal of Audiology, 54(11), 838-844. Heywood, R., Gao, Q., Nyunt, M. S. Z., Feng, L., Chong, M. S., Lim, W. S., ... & Ng, T. P. (2017). Hearing Loss and Risk of Mild Cognitive Impairment and Dementia: Findings from the Singapore Longitudinal Ageing Study. Dementia and Geriatric Cognitive Disorders, 43(5-6), 259-268. Hsu, T. J., Tsai, H. T., Hwang, A. C., Chen, L. Y., & Chen, L. K. (2017). Predictors of non‐pharmacological intervention effect on cognitive function and behavioral and psychological symptoms of older people with dementia. Geriatrics & Gerontology International, 17(S1), 28-35. Liu, L., Shen, P., He, T., Chang, Y., Shi, L., Tao, S., ... & Wang, J. (2016). Noise induced hearing loss impairs spatial learning/memory and hippocampal neurogenesis in mice. Scientific Reports, 6. Mamo, S. K., Nirmalasari, O., Nieman, C. L., McNabney, M. K., Simpson, A., Oh, E. S., & Lin, F. R. (2017). Hearing Care Intervention for Persons with Dementia: A Pilot Study. The American Journal of Geriatric Psychiatry, 25(1), 91-101. Mosnier, I., Bebear, J. P., Marx, M., Fraysse, B., Truy, E., Lina-Granade, G., ... & Godey, B. (2015). Improvement of cognitive function after cochlear implantation in elderly patients. JAMA Otolaryngology–Head & Neck Surgery, 141(5), 442-450. Stahl, S. M. (2017). Does treating hearing loss prevent or slow the progress of dementia? Hearing is not all in the ears, but who's listening?. CNS Spectrums, 1-4. Zheng, Y., Fan, S., Liao, W., Fang, W., Xiao, S., & Liu, J. (2016). Hearing impairment and risk of Alzheimer's disease: a meta-analysis of prospective cohort studies. Neurological Sciences, 1-7.